The Abaya Thai Restaurant is known for serving all your favorite Thai dishes, including Basil Sauce Chicken, Green Curry Sauce Beef, Pad Thai, Pineapple Fried Rice, & etc. Located at 318 W. 36th Street, New York, NY 10018, our restaurant offers a wide array of authentic Thai food, such as Basil Sauce Chicken, Green Curry Sauce Beef, Pad Thai, Pineapple Fried Rice. Try our delicious food and service today. 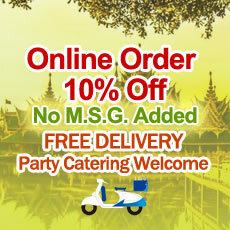 Come in for an Thai Lunch Special or during evenings for a delicious Thai style dinner.